Positioning yourself as a niche expert when you're selling services to businesses dramatically increases your chances of getting hired and the amount you can charge. A plumbing business is much more likely to hire you if they know you're an expert at helping plumbing businesses with their online marketing. 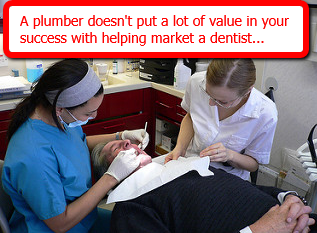 The services you actually provide to a plumber might be exactly the same as the services you provide to a dentist but the plumber doesn't see it that way. He wants someone who can help him with problems that he thinks are unique to his business. Join me on Facebook and message me personally, I will definitely tell you exactly how you go about positioning yourself as a niche expert.